FBI's Uniform Crime Report (UCR) - provides criminal statistics nationally, as well as by region, state, and city. ABA Death Penalty Due Process Review Project — The Project conducts research and educates the public and decision-makers on the operation of capital jurisdictions’ death penalty laws and processes in order to promote fairness and accuracy in death penalty systems. The Project encourages adoption of the ABA’s Protocols on the Fair Administration of the Death Penalty; assists state, federal, and international stakeholders on death penalty issues; and collaborates with other individuals and organizations to develop new initiatives to support reform of death penalty processes. Capital Punishment or Compassion: Executions in the State of New Mexico: The Death Penalty Since Territorial Days - provides the names, crimes, and dates of execution for those executed in New Mexico. Center for Death Penalty Litigation - The Center for Death Penalty Litigation is a non-profit law firm that provides direct representation to inmates on North Carolina’s death row, as well as consulting with and training attorneys who practice capital litigation across the state. Death Penalty Worldwide - International death penalty database. Derechos - provides links to a variety of death penalty sites. History of Executions - Explores history of executions prior to the advent of lethal injection, and explores issues of present day lethal injection procedures. Innocence Project Web Site - Comprehensive Web site of the Innocence Project at the Benjamin N. Cardozo School of Law. The site contains case profiles, other innocence projects, DNA legislation and news, and much more. Internship Opportunities in Capital Defense Offices - this site has law student internship opportunities (both summer 2014 and year-round) in offices around the country that are engaged in the defense of death row inmates or capitally-charged defendants. Legal Broadcast Network - A resource of videos for lawyers covering many aspects of law. MacArthur Justice Center - A non-profit public interest law firm affiliated with the Northwestern University of Law. The center concentrates on cases that raise constitutional or significant issues in the field of criminal justice. National Death Penalty Archive, University at Albany - An archival collection of materials from death penalty activists, researchers, litigators, and others covering the history of the death penalty in the United States. National Registry of Exonerations - The National Registry of Exonerations is a joint project of the University of the Michigan Law School and the Center on Wrongful Convictions at Northwestern University School of Law. It provides detailed information about all known exonerations (for all crimes, not just death penalty crimes) in the United States since 1989 - cases in which a person was convicted of a crime and later cleared of all the charges. Equal Justice USA - a national, grassroots organization working to build a criminal justice system that is fair, effective, and humane, starting with repeal of the death penalty and increased services to families of homicide victims. The Innocence Project of The National Capital Region (IPNCR) - in Washington, D.C. at the Washington College of Law at American University. People of Faith Against the Death Penalty - a national nonprofit organization with information on educating, organizing, and mobilizing religious leaders and laity in religious communities towards abolition of the death penalty. Students Against the Death Penalty - is a student-run organization that mobilizes youth through education and advocacy. Witness to Innocence - is the nation’s only organization composed of, by, and for exonerated death row survivors and their loved ones. The organization challenges the American public to grapple with the problem of a fatally flawed criminal justice system that sends innocent people to death row. One of Witness to Innocence’s primary goals is to empower death row survivors and their loved ones to be effective leaders in the death penalty movement. It provides an essential network of peer support for these individuals as they respond to the challenges and opportunities of life after exoneration. Abolition UK - the only nationwide (UK) grassroots organization focused solely on the issue of death penalty abolition. They aim to strengthen the international dimension of the struggle against capital punishment. Association SAVE - provides support for individuals with claims of innocence on death row in the U.S.
Death Watch International - Organization based in the UK exploring the issue of the death penalty on a global scale. Their comprehensive website contains stories, news and factual information on the status of the death penalty around the world. Keine Todesstrafe (No Death Penalty) - a weblog with information in German and English. International Commission against the Death Penalty - an international organization favoring abolition of the death penalty. World Coalition Against the Death Penalty - Coalition committed to the universal abolition of the death penalty. University of Alaska Anchorage Justice Center - general information about the death penalty as well as specific information about Alaska. General information includes history and recent developments, link to Supreme Court cases, death row inmates and facilities, debate topics, specific issues and international topics. Death Penalty Focus Justice Advocates Project - empowers people with firsthand experience of the death penalty system, including the wrongfully convicted and law enforcement professionals, to become advocates for fairness and justice. Better Priorities Initiative - Colorado-based group focusing on reprioritizing money used for the death penalty to other programs for the state. Kentucky Coalition to Abolish the Death Penalty - includes newsletters, links to other sites, and announcements about various events that Abolition 2000 is promoting. Louisiana Coalition for Alternatives to the Death Penalty - a grassroots coalition dedicated to achieving non-violent and effective alternatives to the death penalty. Nevada Support: Nevada Coalition Against the Death Penalty- This nonprofit coalition and group, aims to provide support for death row inmates, family members and friends. The site provides updates on Nevada death penalty news, urgent actions, and prisoners' art work, writings, and articles..
New Jerseyans for Alternatives to the Death Penalty - dedicated to winning public and political support for an immediate suspension of all executions in New Jersey for a minimum of two years. Dead Man Walking School Theater Project - project that raises awareness of death penalty issues through Sister Helen Prejean's book of the same title. Kairos Campaign - A decade-long campaign in the 2010s coordinated by People of Faith Against the Death Penalty to mobilize thousands of clergy and lay and religious leaders towards abolition. ReligionLink - A site that helps journalists develop and write informed stories about religion. (Link goes directly to death penalty). ACM – Agir pour les Condamnés à Mort (To help the Sentenced to Death) - French site for correspondence with US inmates. Prisoner Solidarity - Serves as a catalyst for communication between prisoners and people on "the outside." Life Lines - A UK-based organization that facilitates correspondence with prisoners on death row in the U.S. The Free Will Project - A group encouraging people to add a clause to their last will and testament stating their opposition to capital punishment and their wish that, should they be murdered, their assailant not receive the death penalty. Execution Chronicles- A site that explores various aspects of crime and punishment through the case of a hate crime which resulted in a death sentence. Criminal Justice Programs with capital punishment focus. 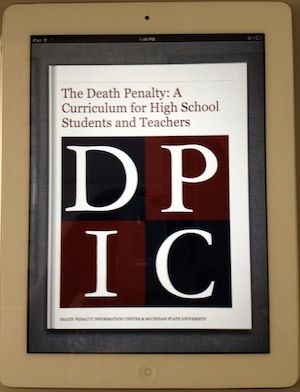 High School Curriculum iBook - Our High School Curriculum in iBook format for iPad. This new format enables users to navigate through the content in a touch-screen environment. Even when students are not on-line they can use the full curriculum and have access to instant definitions of every word and easy note-taking functions. High School Curriculum - Our High School Curriculum website. Lethal Injection - Covers the growing debate on the constitutionality of lethal injection. Religion Resources - What the religious community is saying about the death penalty. Student Resources - Assists students writing reports and planning debates. Death Penalty for Offenses Other Than Murder - Statutes that contain capital crimes other than those involving the murder of the victim. Innocence Cases - Now includes many full text articles on the different exonerees. Time on Death Row - The length of time inmates spend on Death Row and the implications of that time. Characteristics of Death Row Inmates - Includes education levels and age at time of the crime. 2007 Thurgood Marshall Award Winners - Awards recognize those writers and producers who have made an exceptional contribution to the understanding of capital punishment. College Curriculum - This dynamic new curriculum examines capital punishment through the case-study method and is adaptable to a variety of academic disciplines. Fact Sheet - Updated every two weeks, this 4-page summary covers executions, death row, and much more (in PDF format). Execution Database - This searchable list includes facts on all executions since 1976 and is updated with each execution. Article Index - Information on key death penalty stories in the media over four years.